It’s the time of year where I like to send a small thank you to all the teachers, coaches, and other caring adults who work with my children. 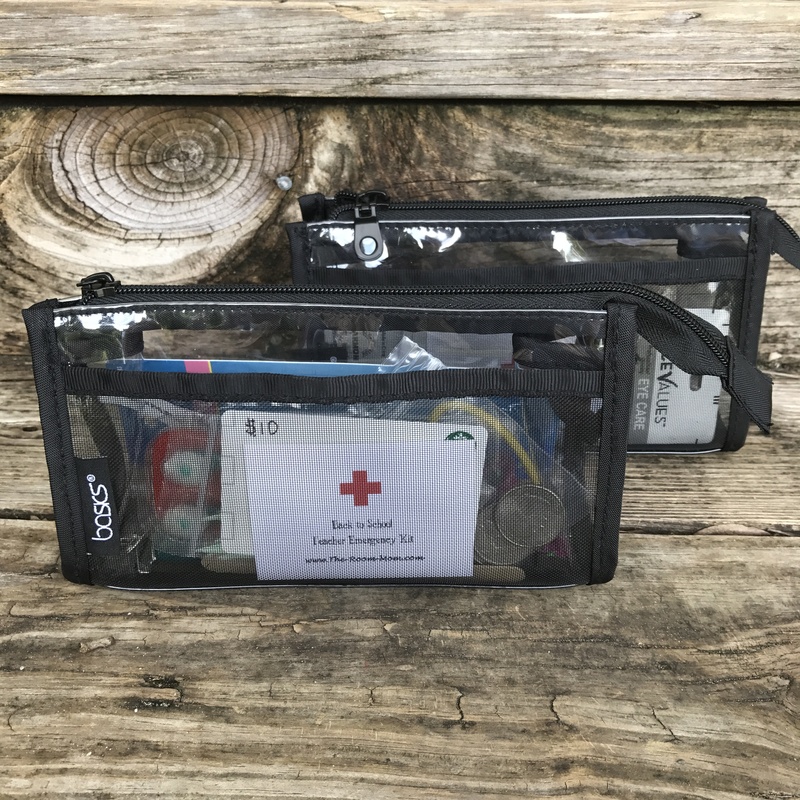 It adds up to more than 20 little gifts, so I am always looking for something that I can make in bulk AND will be something that the receiver might use. I typically go for something consumable meaning the gift receiver can eat the item, or it has a one time use and then is gone. 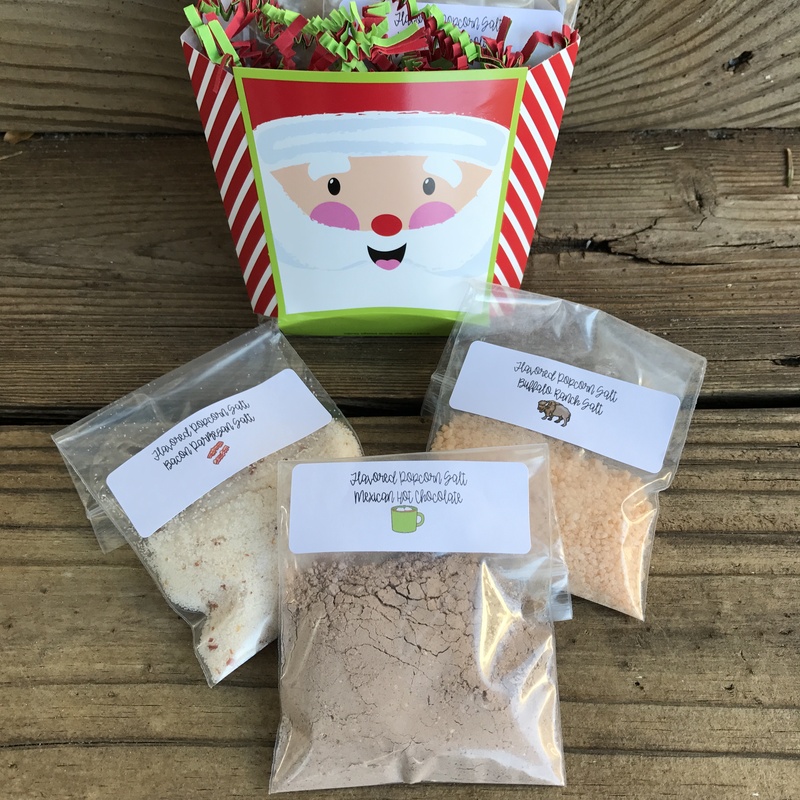 This year, I made flavored popcorn salts. 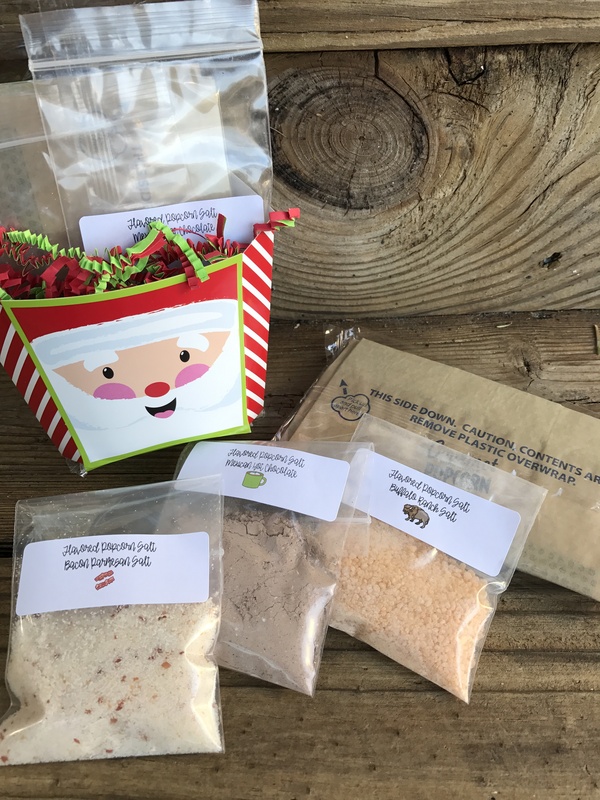 There are many recipes available and lots of cute ways to package the salts to give as a gift. I found containers that look like French fry boxes at Hobby Lobby. 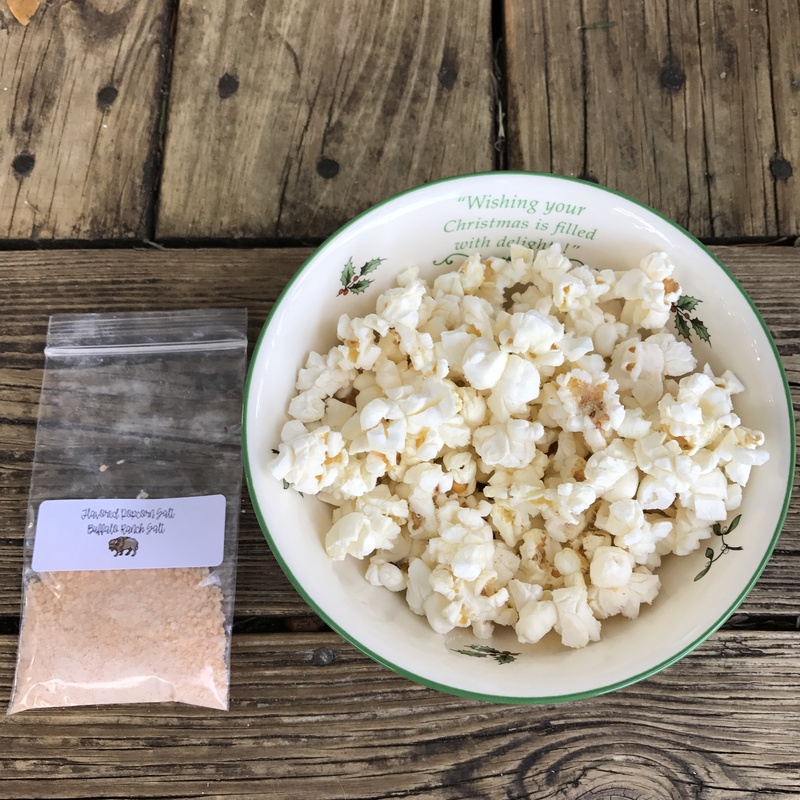 I put one package of microwave popcorn in each container along with a variety of mini bags of flavored salts. 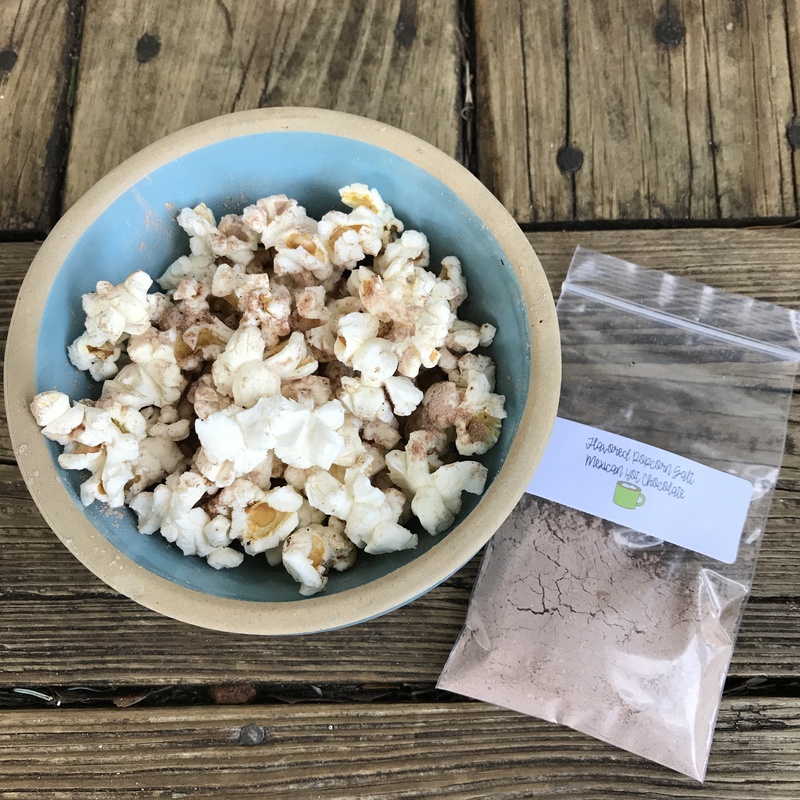 Even if our teacher friends don’t use the salts, most people I know will eat popcorn, and it is something that can be a good snack to make at school (although you have to be careful not to pop in a central location because the smell does linger!). 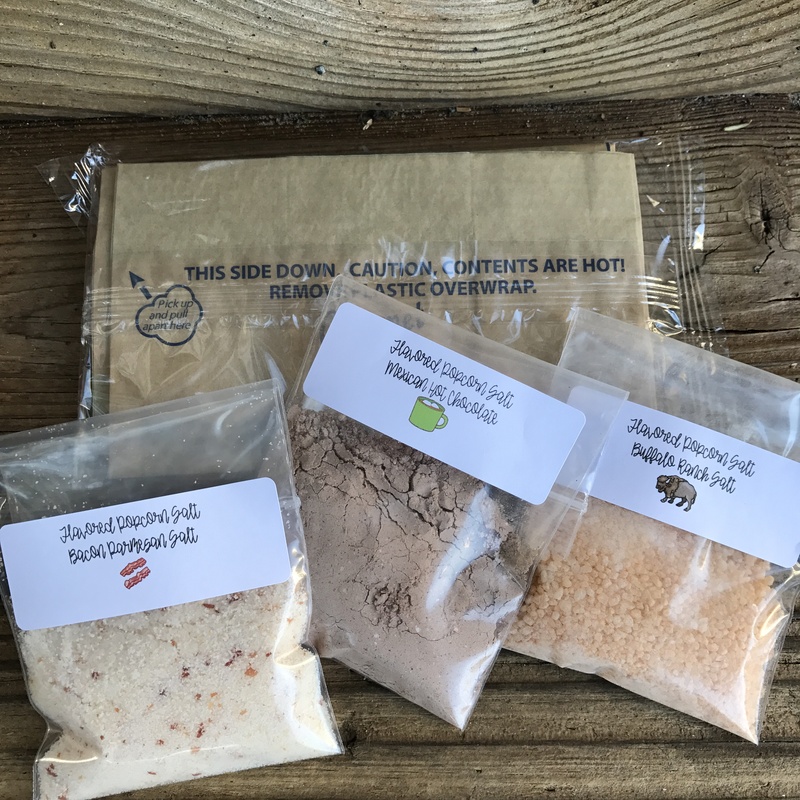 We gave a mix of 3 salt flavors– Bacon Parmesan, Buffalo Ranch, and Mexican Hot Chocolate (my favorite). I read through a handful of recipes by doing a Pinterest search and then clicking through to the websites. I used recipe ideas from THIS WEBSITE and THIS ONE. For our popcorn packets, I bought “light” microwave popcorn because that type usually has the lightest amount of salt and butter flavor. You need the least amount of salt and butter as possible to start because the flavored salts are SALTY, so use sparingly. Of course, you could always pop your own popcorn from scratch and control the salt amounts that way. I printed THESE LABELS for the mini bags. 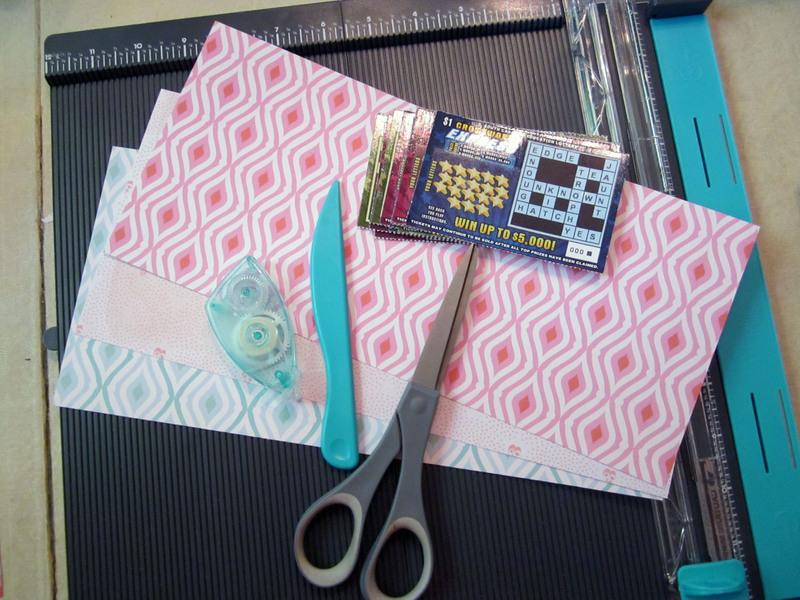 I used my favorite 3″ x 5″ bead bags that I get from Michael’s Crafts and Avery labels 8160, size 1″ x 2 5/8″. The salts can be sprinkled on meat, eggs, or anything to which you would normally add salt. Based on the few blog posts I read, it is really easy to create new combinations so think about flavors you enjoy and start mixing! If you want to take this idea and make the gift a little more substantial, add a movie gift card for your local theatre or a gift card for Redbox. 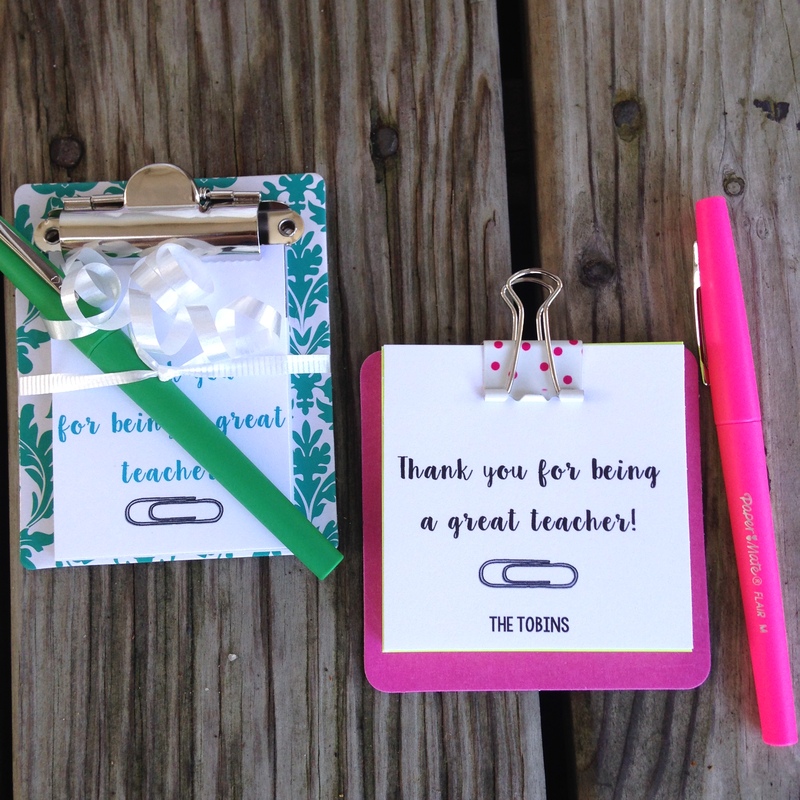 Did you see my LAST POST with information about a fun back to school teacher gift? I’m having my annual giveaway, so you don’t have to put one together yourself; you can win two! 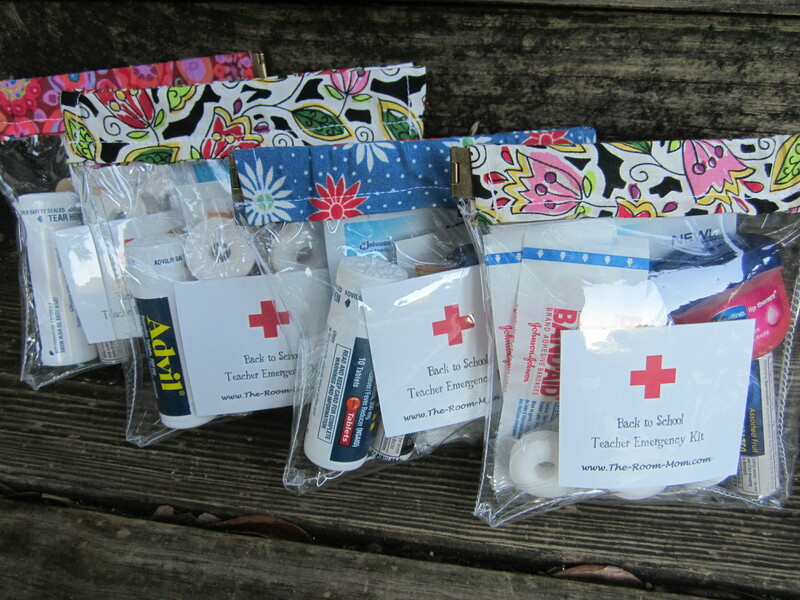 One Lucky Winner Will Receive TWO Back to School Teacher Emergency Kits! 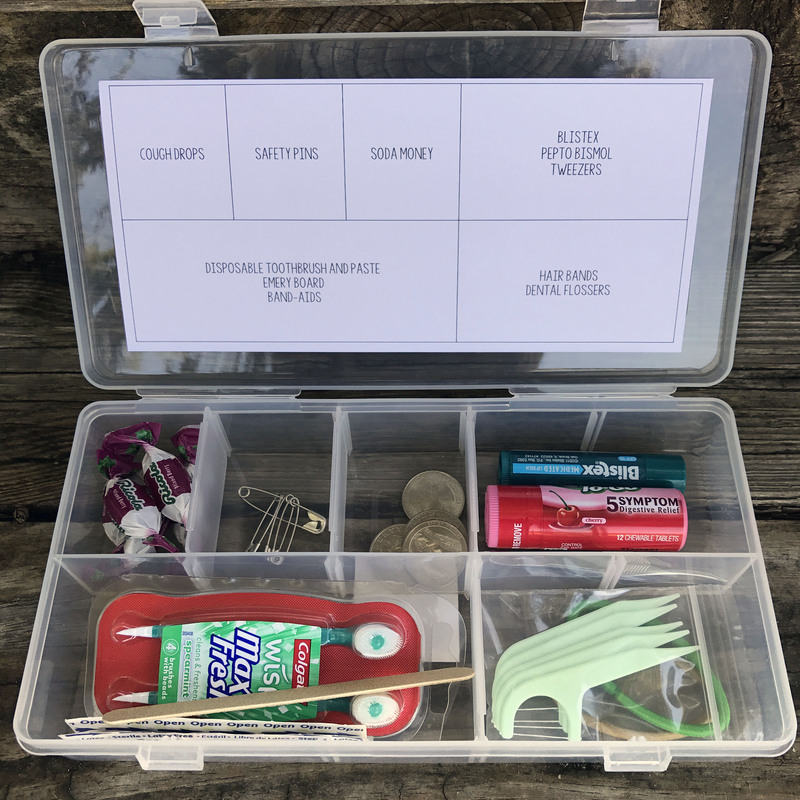 Keep one kit for yourself and give one to a teacher friend (or make two teachers, friends, co-workers, neighbors… super happy and give both as gifts). Giveaway ends this Saturday, August 5 at 3 PM (EST). Shipping addresses must be within the USA or Canada. 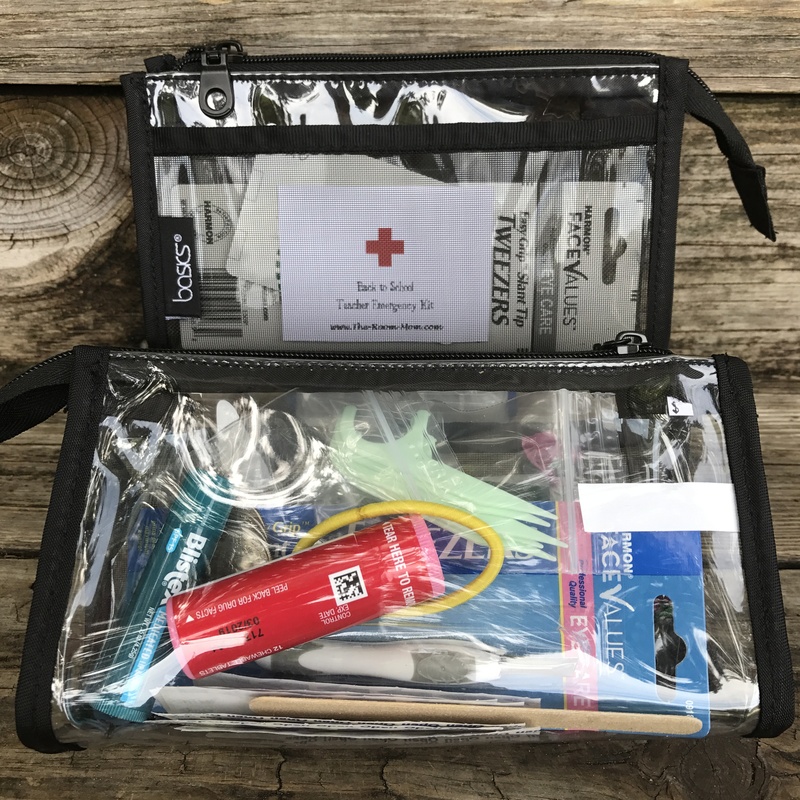 The winner will receive two clear cosmetic bags and emergency kit contents. 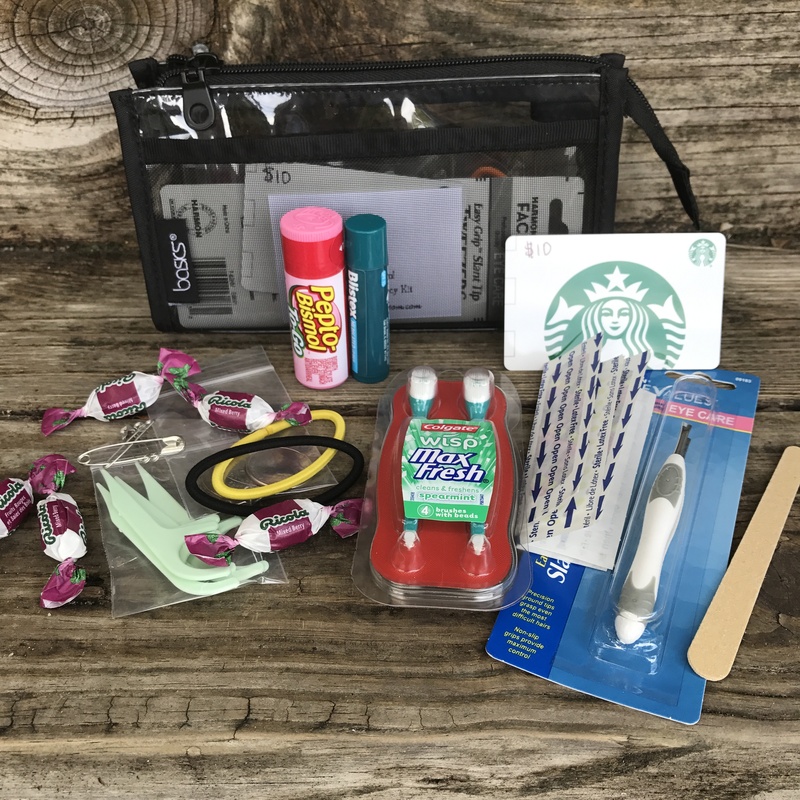 Each kit contains a $10 Starbucks giftcard, Blistex, travel sized Pepto Bismol chewables, cough drops, dental flossers, two hair bands, four quarters for soda money, disposable toothbrush and paste, Band-aids, tweezers, and an emery board. 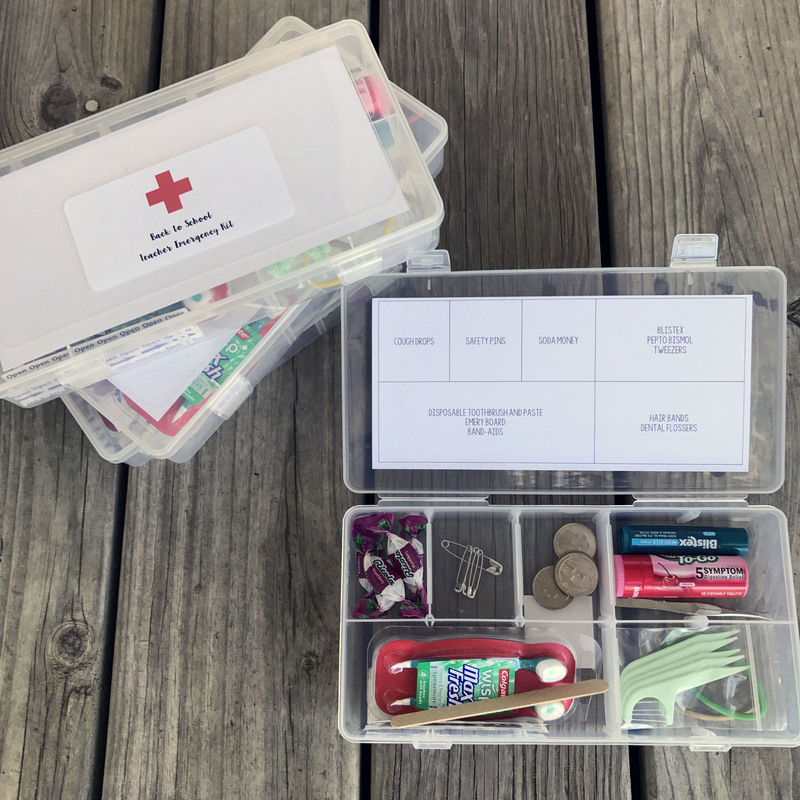 To enter, comment on this blog post with any teacher or parent (or teacher parent) life emergency supply, trick, or advice you have. Do you have a great MacGyver-type move that really saves the day? I’ll share one– if you need deodorant in a pinch because you live in South Carolina and have recess on a playground in direct sun at noon with little shade, and you get totally sweaty no matter what you do, wipe some hand sanitizer under your arms with a Kleenex. You can also leave a comment on any of my INSTAGRAM and FACEBOOK giveaway posts for additional entries. Each comment = one entry. Random name chosen from all comments when the contest ends 8/5/17 at 3 PM (EST). 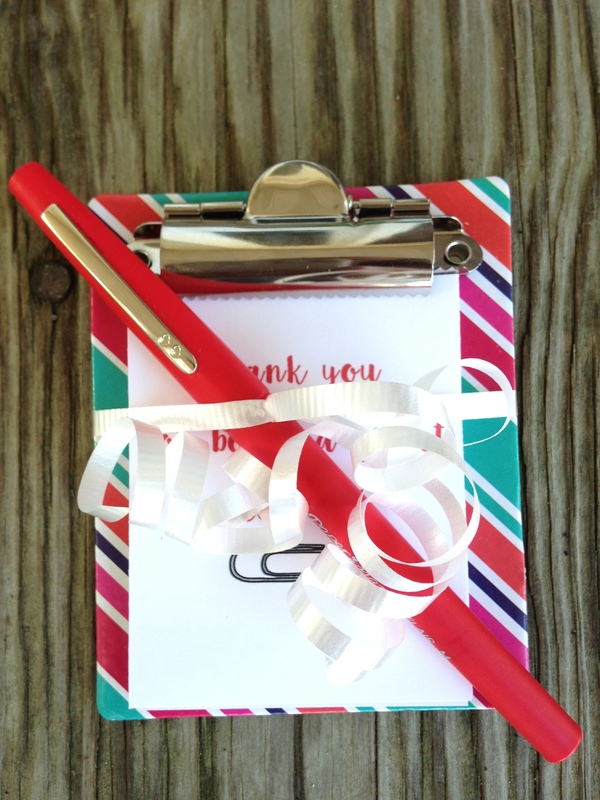 If you are new to TheRoomMom, you may not know about a fixation I have for teacher gift giving. 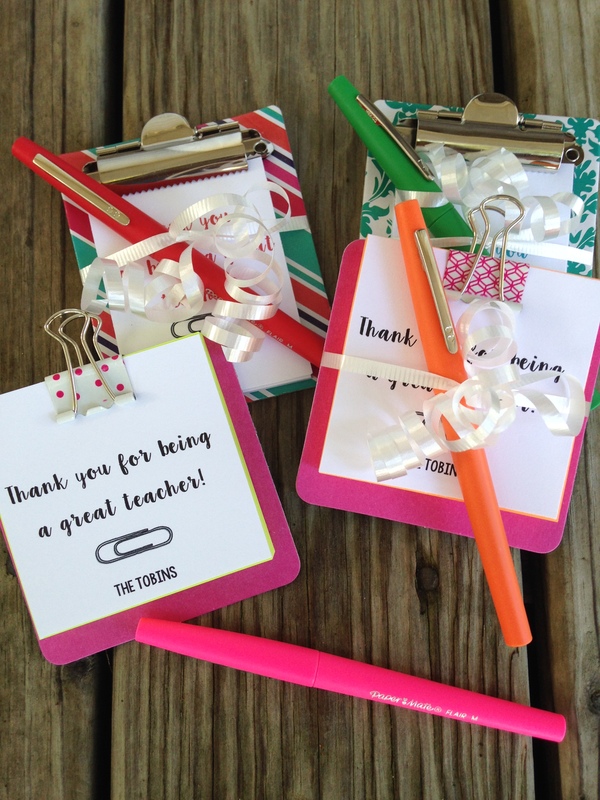 I love putting together small appreciation gifts for my children’s teachers throughout the year. 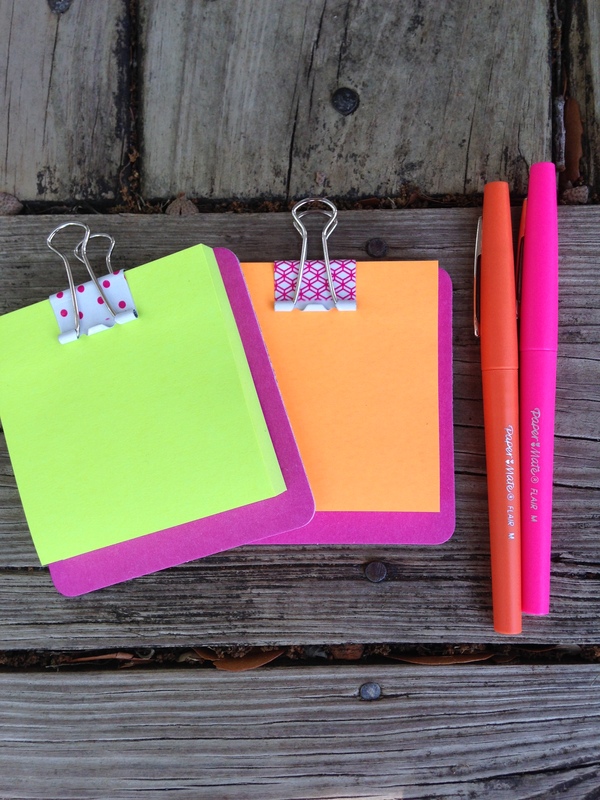 For our end of year teacher gifts, I don’t even pretend to think about new ideas any more. We repeat the scratch off lottery ticket gift that we have been giving to the teachers and staff at our school for the past three years. The part we do change is the receptacle we use to deliver the lottery ticket. 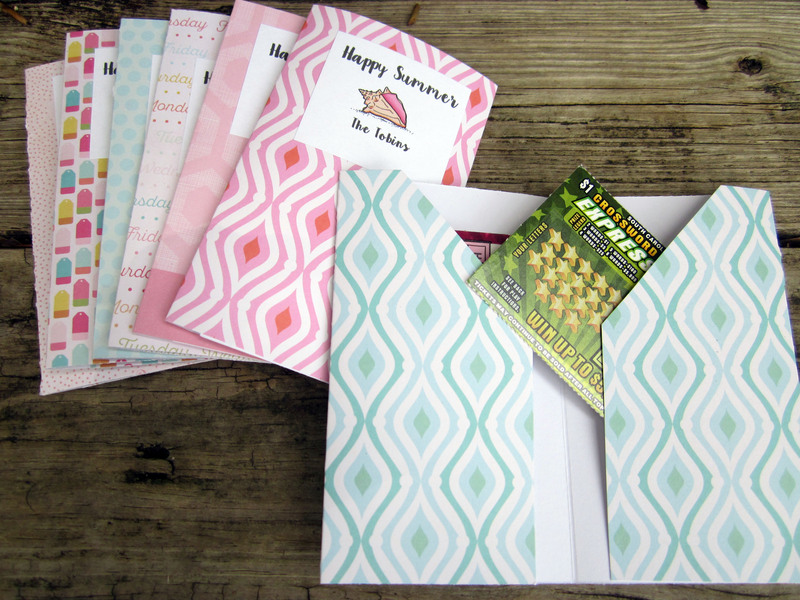 This year we made mini pocket folders with cardstock weight scrapbook paper. 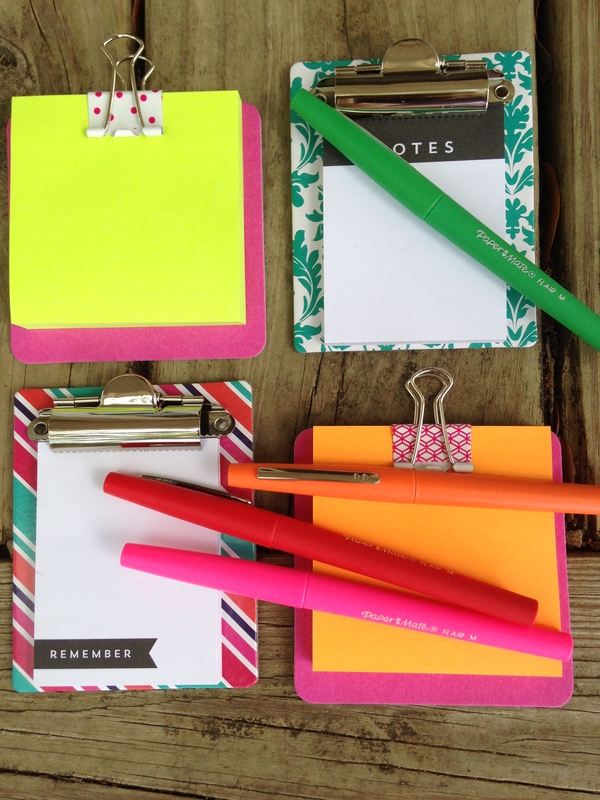 They are easy to make, and it was fun choosing the paper and coordinating washi tape. Set the paper in a landscape direction. Using the tool to make score lines on your paper, press a line at 2 3/4″, a line at 6″, and a line at 9 1/4″. Fold the paper in half along the 6″ score line. Open the paper and fold the two outer edges towards the middle. The decorative side of the paper should be on the outside. Near the top of one flap, trim the corner. 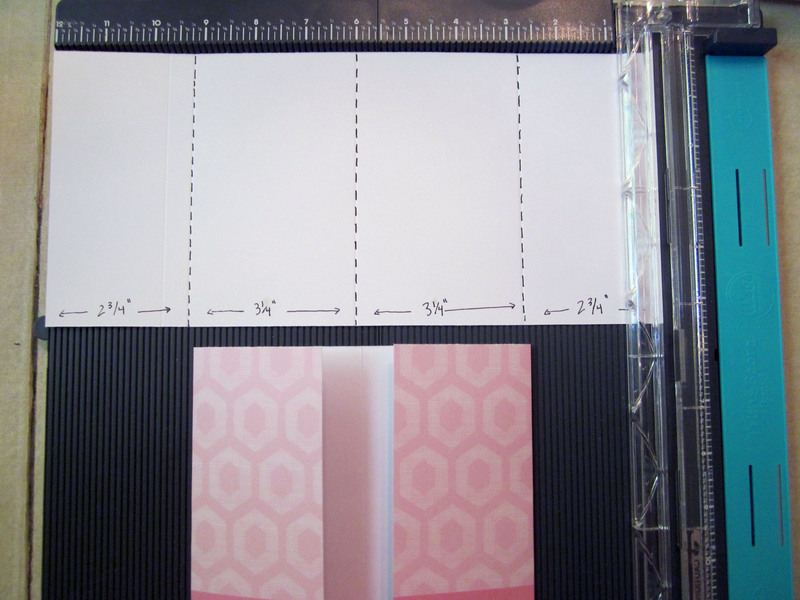 Start about one inch from the outer fold at the top of the paper and cut down at an angle to cut a triangle. 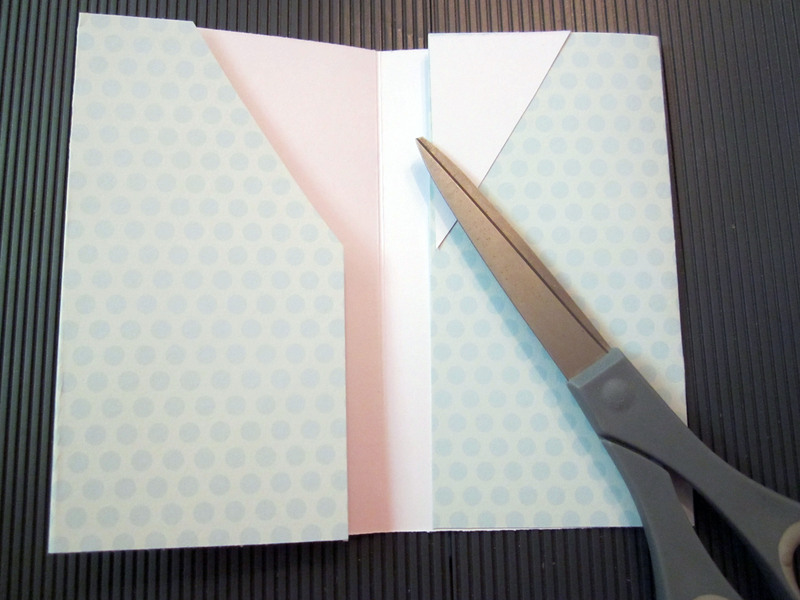 Take your triangle scrap and flip it over to use as a guide to cut the triangle on the other side of the folder. 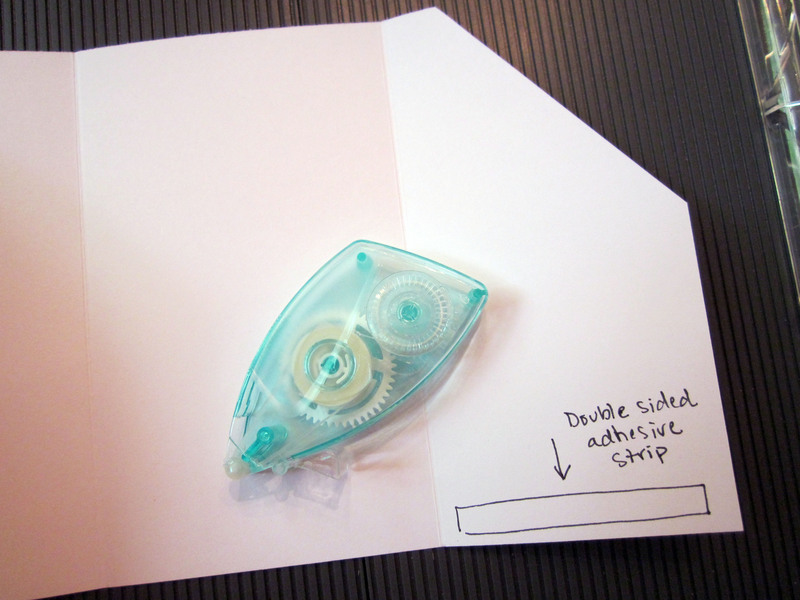 Run an adhesive strip at the bottom of the paper on the outer flaps. Press the flaps down to attach the bottom of the paper together to form the pocket. Stuff the pocket folder with your materials. 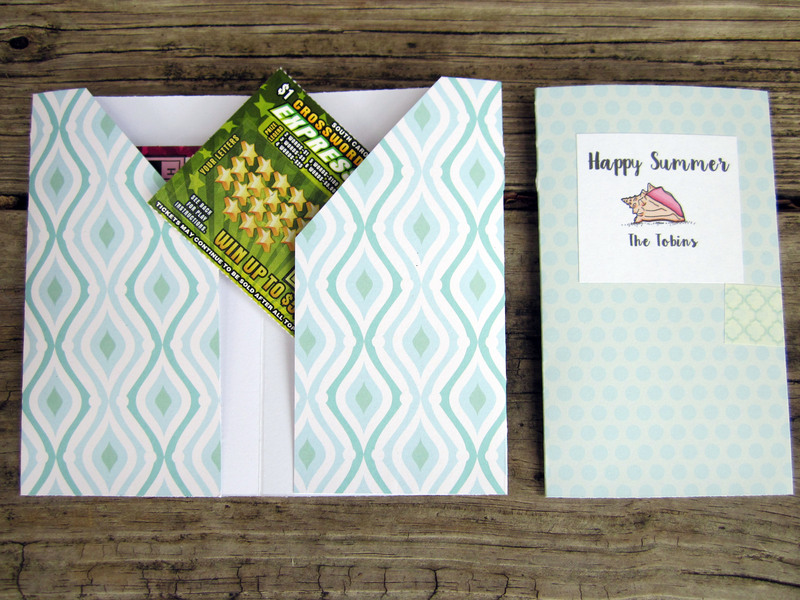 We filled with three $1 scratch off lottery tickets, but the pocket folders are a good size for gift cards or even a thoughtful note. Attach a label on the front cover. I printed Avery 2″ x 4″ labels and cut the sides down to make the labels ~2″ x 2″. 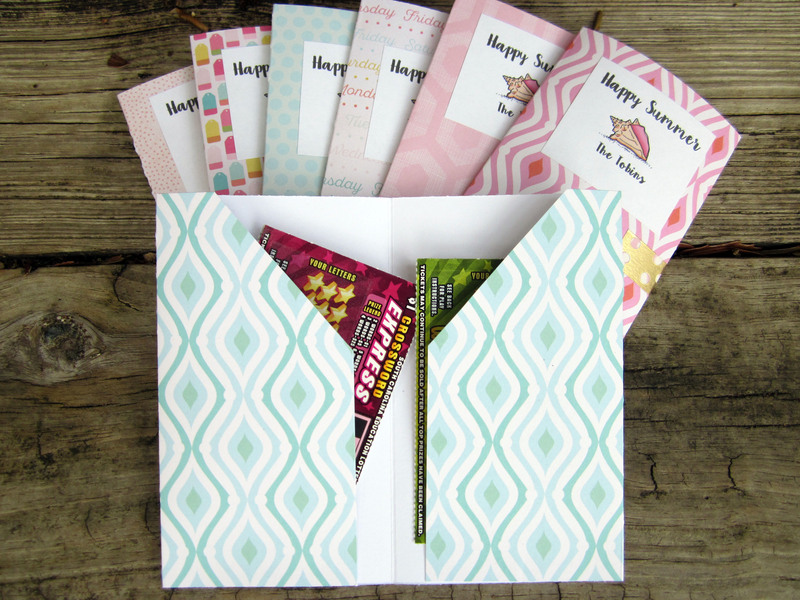 You could also print on plain paper, cut apart, and glue to the front of the pocket folder. Seal the folders closed with a piece of washi tape or a sticker. 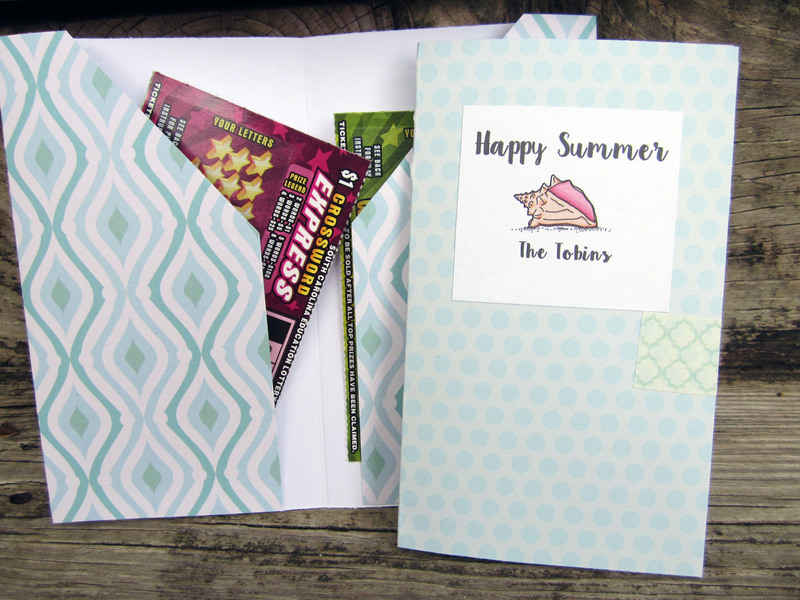 To see my other ideas for making lottery ticket– or gift card– holders, CLICK HERE or HERE or HERE.